Within this section the issues linked to the growth of the biomass sector will be introduced, looking at what has influenced the change in energy source, what legislation has been introduced and some of the other issues are that will affect its success. South Yorkshire's woodland owners, the issues that may affect these and the potential future of the sector are also analysed. Climate Change is an issue that now affects the decision making processes of most national and local governments, and the UK Government "has taken a lead in policy climate change development" (TSO 2009, p.10). This is one of the reasons why it asked Sir Nicholas Stern to complete a report on the subject. The report found that preventing the continued rise in carbon emissions by developed countries is an important part of stabilising the amount of greenhouse gases in the atmosphere; the reason the report focused on developed countries was because heavy industry, transport and home electricity and heating were found to be heavily reliant upon carbon-based fuels (UK Treasury 2006). The curbing of worldwide deforestation and utilisation of woodland is viewed as a cost-effective method of lowering greenhouse gas emissions (TSO 2009). Increasing the UK's woodland coverage, whilst making use of a low carbon fuel (woodfuel) is viewed as a reasonable approach to reducing the UK's carbon emissions in a sustainable manner (TSO 2009). The Climate Change Bill became law in 2008; its aims are included in Appendix A. The main aspects of this included becoming a world leader in the transition to a low carbon economy, an 80% cut in (compared to 1990 baseline figures) greenhouse gas emissions by 2050 and the introduction of carbon budgeting to the market (Department for Climate Change 2012). Within this 15% of renewable energy the UK’s aspiration is to produce up to 30% of this through biomass use (DECC 2009). Results of modelling from this strategy indicate that up to 12% (72 TWh) of heat demand in the UK could come from renewable sources by 2020 (DECC 2009). One of the key goals of this strategy is to decarbonise the electricity generation process (DECC 2009), and the strategy aims to utilise wind power to produce the majority of the target, but 22% of this target requires bioenergy to be used (DECC 2009), with large power stations (Drax and Ferrybridge) targeted with the growth of co-firing as part of electricity production (Environment 2007). The UK has targeted that by 2020 12% of its heat will be produced by renewable sources such as biomass, biomass boilers utilise the waste wood that derives from woodland management. Increased levels of woodland management could lead to more waste wood in the market, and this increase in supply plays a role in the increased demand of boilers and the fuel. To meet the Renewable Energy Strategy's target of 13TWh of energy derived from woodfuel by 2020, the CEBR (2010) study discovered that approximately 5.5 million green tonnes of woodfuel would be required to meet these targets, with an increase in woodfuel energy capacity from over 1,100MW in 2010 to over 5,200MW in 2020 (CEBR 2010). This incentive was first consulted on in 2008, but was not introduced until November 2011, with many changes to the original concept. 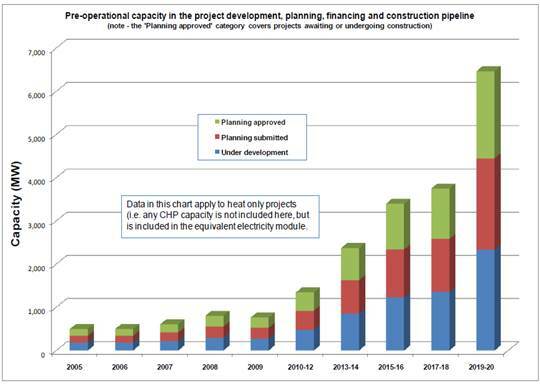 It was planned to be a driver for the large production of heat at low cost, with an increase in renewable heat from 1 to 12% by 2020 (DECC 2009), but the scale and size of the initial concept was minimised as the global recession of 2009 forced the UK Government to re-assess all spending.. The incentive has been put in place to support the growth of the renewable heat production sector (DECC 2011), it incentivises the procurement of biomass boilers and use of renewable heat by supplying the customer with a subsidy for every megawatt hour of energy produced. It is supported through central Government funding, with a limited amount of money available for customers across the UK (DECC 2011). "The CRC is a mandatory scheme aimed at improving energy efficiency and cutting emissions in large public and private sector organisations" (DECC 2012). This scheme's aim is to reduce the emissions of large emitters of carbon dioxide through charging users for the amount they use annually, this money is then recycled into public finances, to deal with environmental issues (DECC 2012). It was put in place by National Government and is run by the Environment Agency (DECC 2012). Local authorities are included on the list of possible emitters. Table 2 demonstrates the cost advantages of utilising woody bio-energy in comparison to other fuel sources, it shows that electricity is approximately 5 times more expensive to purchase per KWh. The UK government's renewable targets state that by 2020 they aim to generate 12 % of heat through renewable energy sources (CEBR 2010). Within these targets approximately 30% is planned to come from biomass. The most efficient method for energy production from woodfuel is through the use of woodchip in non-domestic boilers (Forestry Commission 2006), in particular in areas of the country within close proximity to a woodland resource; this is linked to the associated lower transport costs. Facilities such as schools, hospitals, offices and sports facilities are also well positioned to maximise the efficiency of the technology (CEBR 2010). There is a limited supply chain in operation within the UK for the biomass market to compete effectively with other sectors (Forestry Commission 2008). The Forestry Commission and the UK Government plan to develop this supply chain, and link woodlands to wood users (Forestry Commission 2006). The supply chain for biomass requires both a supplier and an end user, without a managed woodland selling reasonably priced material then there will be no demand. Without a demand in the market for more woods to be managed, brought about through an increase in biomass boilers, then any rise in biomass usage is impossible (Forestry Commission 2006), the role of the FC in stimulating the market, at all points, can ensure that the sector will continue to grow sustainably (Forestry Commission 2008). High quality timber is sourced by the timber trade, but within this industry there will be off-cuts that cannot be used by them, either in the woodlands or in sawmills (Forestry Commission 2006); the biomass sector utilises this underused resource. There are also woodlands, either young or of low quality, that are not managed for timber in the short term, there is the potential for the biomass market to stimulate the management of these woodlands through the demand for lower quality material and then producing higher quality timber in the future (Forestry Commission 2006). Figure 3 illustrates the different levels of woodfuel supply chain, demonstrating where the fuel comes from. Between 2005 and 2009 there was a drop in demand for softwood products in the timber sector (Table 16 ), drops in demand such as this have the potential to reduce timber prices and woodland management. In the AFO’s 2011 report they noted the potential growth in the sector is linked to "current and impending environmental legislation, grant support, and agreements to reduce carbon emissions" (AFO 2011, p17), the authors also noted that the use of many sources of waste wood was an area of potential growth. Restrictions on the disposal of arboricultural arisings could also bring more material into the sector, as LAs (Local Authorities) and tree surgeons are required to dispose of these materials in a more environmental manner (AFO 2011). Marketing and influencing strategies (Collins et al. 2003). A mix of the above strategies can help an organisation to get its message over to its target audience; an awareness of cultural, psychological and social factors is also important to correctly frame the message (Collins et al. 2003). Government bodies may struggle to influence private woodland owners to change the management of their woodlands, as trust in these bodies has waned (Collins et al. 2003), with only one third of the public believing that Government acts in the public interest (Collins et al. 2003). The social learning theory looks at how behaviour spreads through society (Collins et al. 2003), presently many private woodland owners do not manage their woods for energy or timber production, with climate change issues not a motivating factor (Lawrence and Dandy 2010), if woodland management, linked to climate change, became normalised within society and spread down from bodies such as the FC the change in behaviour could be interesting to measure. Within Kollmuss & Agyeman (2002) article the authors looked at Stern et al’s 1993 theory, within the article they claimed that the egoistic orientation is the strongest orientation (in comparison to the biospheric and social orientations) (Kollmuss and Agyeman 2002), yet this can only “be a motivator for pro-environmental behaviour as long as the action serves the person’s needs and wants” (Kollmuss and Agyeman 2002, p.8). Linking together a woodland owner’s “needs and wants” with the social pressure that may come from a change in behaviour could help to alter woodland management across the UK. 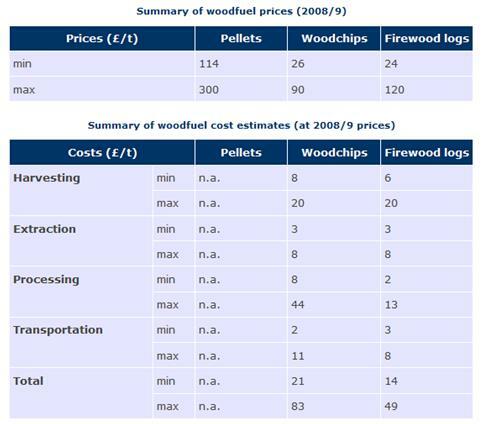 Within Appendix C the table by the FC demonstrates that large gap between the minimum and maximum prices required to produce woodchip (£21-83), as well as the sale price (£26-90) per tonne. This report (Forestry Commission 2008) demonstrates the lack of published figures into the procurement of raw material and the sale price to customers. The lack of accurate figures ensures that predictions into the growth of this sector are hard to verify. "As the forest matures both the species composition and the size composition of individual species may change. These changes may have important implications for the value and the management of the forest" (Campbell 1999, p.1). "The combined effect of rising biomass and rising unit value of biomass will offset any tendency towards rising harvesting costs per hectare. This means that stumpage value per hectare will rise as the age of the stand increases" (Campbell 1999, p.2). In the Per-Martin Fors' (2009) study the author compared the systems in place in different countries. In the study the biggest predicted growth within the sector did not come from forestry biomass, but from waste wood and sewage sludge (Fors 2009). In both Sweden and Germany the research found that subsidies and tax reliefs were the most important incentives for the development of their biomass sectors (Fors 2009). The research found that an awareness of who invests in energy production and what motivates them is an important aspect of understanding the energy sector. Within Fors' article he stated that 63% of respondents claimed that the existence of the Swedish Green Certificate System was a determining factor in their investment system. Without subsidies from governments the technology cannot stand alone, so requires short to medium term investment to reduce the economies of scale (Fors 2009). In Jablonski et al's (2010) paper the authors researched into the plausible routes for the UK bio-energy. Using the Markal modelling system, which analyses long-term projections for future energy use, the authors came to the conclusion that biomass can play an important role in energy provision in the future, but this is based on a diversification of the energy markets, with more flexibility regarding the materials used to produce energy e.g. increased levels of bio-diesel in cars and farmers growing bio-energy crops (Jablonski et al. 2010). "Securing feedstock quantity and quality, the availability of infrastructure required to support the growth in biomass use, (and) local and regional market dynamics" (Jablonski et al. 2010, p.5813). The authors felt that large amounts of imported woodchip are required as part of these goals; as the size of the UK's woodland (especially in certain regions) restricts the levels of dependence on the UK's woody biomass sector (Defra 2007). Table 4 demonstrates the desired growth of the bio-energy boiler sector up to 2020, this predicts that between 2012 and 2020 there will need to be an increase in capacity from 2,800MW to 7,600MW (AEA 2010), but this does not dictate that the fuel is required to be locally sourced. To achieve the above targets in Table 4 the amount of woody materials going into the bio-fuels sector would need to rise from 1 million green tonnes to almost 5.5 million green tonnes (AEA 2010), the targets are based on the desired growth of the market and are linked to the UK's carbon reduction targets, not on an awareness of energy markets or the timber trade. Table 16 shows the reduction in imported timber into the UK between 2005 and 2009, this has an effect on the market, the production of UK timber increases slightly, but its market share increases in most sectors (UK Wood Info (e) 2012). Source: Forestry Commission – Forest Research. Table 17 shows the timber price rise from approximately £27 in 2005 and increase up to £40 by April 2011, this is in conjunction with the decrease of imports shown in Table 16 and could have an impact on woodland management in the UK. 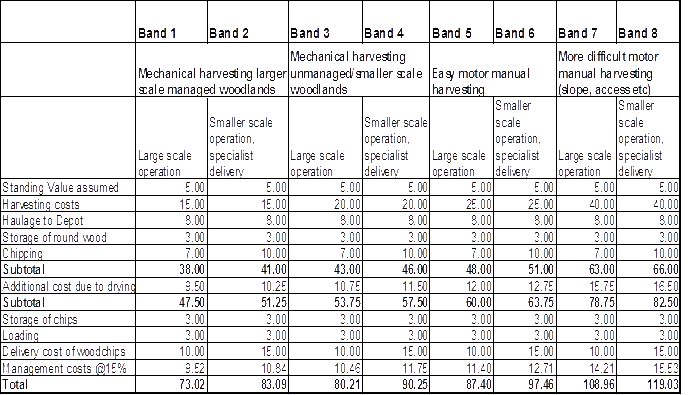 Table 18 shows the variations in costs of harvesting woodfuel, with prices varying from £73 to £119 per tonne, depending on the difficulty of site access and topography. The majority of the UK’s woodlands lie between band 3 and 6. A key issue repeated by many of the interviewees was that South Yorkshire’s woods do not have good access; this has made woodland management less attractive as costs to retrieve the material from site have been high. The rise in the price of timber has allowed for woodland managers to sell their material for higher prices; this has stimulated more management. Table 19 : How important is continued rise to development of woodchip sector? Table 19 shows that over 75% of respondents felt timber prices were either quite or very important to the development of the woody bio-energy sector; this agrees with the interview results. Within South Yorkshire (SY) local authorities own large amounts of woodland, this has a large effect on the region’s timber production, as many authorities do not manage their woodland productively, partly due to lack of departmental liquidity. The majority of foresters manage their woodlands for timber production, with everything else a by-product, but the growth in the bio-fuels sector has forced them to re-assess their priorities. The long-term lack of management in the region's woods has affected the quality of timber available, but of the managed woodlands bio-fuels are of low priority. The funding put in place from the FC incentivises woodland management, but there are many hurdles to cross for land owners who are not registered with the RPA, the time and effort required puts off many land owners. If land owners are part of an umbrella organisation, such as in Austria, where a whole landscape’s woodland is managed by one organisation, then its management can become feasible. The growth of the firewood sector in the region has helped to push up management levels. The presence of a body such as South Yorkshire Forest (SYF) has had a regional impact on South Yorkshire, as they have tried to encourage more woodland management, by linking up land owners with the information on grants available to them. Increased management of woodland in the region could produce more bio-fuels, but the majority of interviewees believe the region’s woodland stock is too small to match potential future demand. At the moment first and second thinnings work in woodlands is uneconomical; the future growth of locally produced bio-fuels may invigorate woodland management. Many interviewees felt that farmers were the ideal market for bio-fuels, as they could manage their own woods and store the material on-site; they could also benefit from the RHI in the future. Woodchip providers, such as Silvapower, supply fuel for LAs and businesses across SY. If woodchip providers can source materials from further afield at cheaper prices they will, as lower material costs can offset the higher transport costs. As the prices of fossil fuels rise so will the demand for woodchip, especially with companies that are closer to biomass providers, as transport costs will be lower. The introduction of the RHI should also enable the sector to grow, as renewable heat will be subsidised. The firewood sector’s growth has enabled the management of woodlands, especially hardwood woodlands; with the high prices currently paid due to its use as a luxury fuel. The use of firewood by farmers could help to invigorate small-scale woodland management, especially as the majority of smaller woodlands are dominated by hardwood trees. Table 20 : Is development of firewood sector a good thing for woodchip sector? Table 20 demonstrates that more than 45% of respondents felt the firewood sector was a good thing for the woodchip sector. This agrees with comments from interviewees. The ownership of large amounts of the region’s woodlands by local authorities and other public bodies is a barrier, as their management is linked to the budgets they receive from national government; the recession has reduced the funding they receive. Without funding to pay for woodland officers this can affect a council’s management practices and grant bids for funding to improve access. 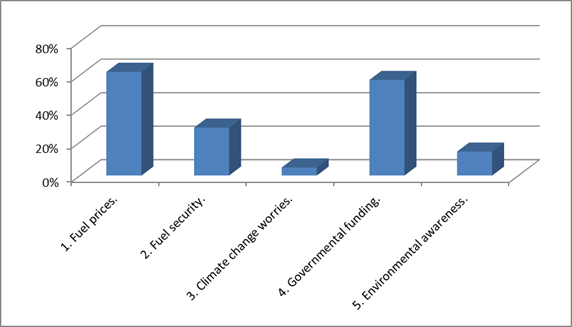 Table 21 : Which of the barriers are most significant to SY bio-energy sector's development? 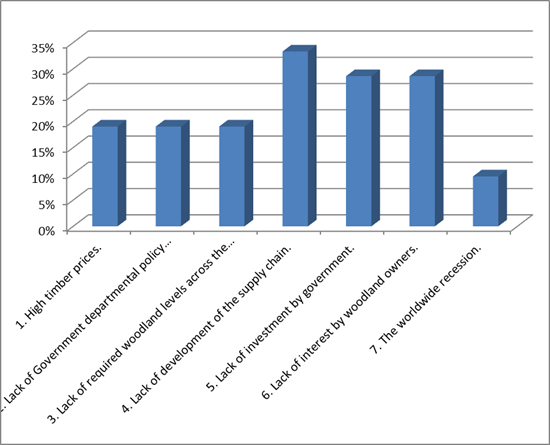 Table 21 demonstrates that lack of development in the supply chain, investment by Government and interest by woodland owners are key barriers. The interview data agrees with these findings. The introduction of the CRC and RHI were meant to incentivise increased renewable energy use by the public, business and LAs, but issues related to these and FITs have dented the confidence of the public. The region’s small woodland coverage means it is unlikely that future demand can be met by the region’s woodlands, Silvapower Ltd sources materials from outside the region and waste wood; an increase in demand is likely to increase this, with some imported material becoming part of the mix in the future. Table 22 : Is there enough woodland in SY for woodchip sector's development? In Table 22 over 55% of respondents felt that South Yorkshire's woodlands were unlikely or not able to supply the region's future bio-fuel demands. 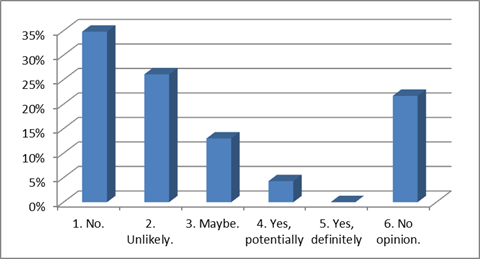 The results from the interviewees agreed with this. Amongst landowners one of the issues that face the sector’s development is that woodland is not always viewed as productive landscape, amongst many it is viewed as either ornamental or for biodiversity. The public opinion of woodlands and woodfuel in general is poor, with many believing it to be unsustainable, no matter how well managed. To receive funding from the FC a landowner is required to follow the required procedure by the FC, this period can take 6 months to complete; many land owners are put off by this. At the moment it is not economically feasible to manage smaller woodlands, especially the thinnings work required in young woodlands. Woodlands with low quality timber and poor access are unlikely to be managed in the future for timber production; the incentives in place are unlikely to change this. The CRC could force LAs to reduce their dependence on fossil fuel use; this could force them to re-appraise their woodland management budgets, as increased management could increase localised bio-fuel supply. The recession of 2009 and associated cuts in LA budgets may force them to re-assess their biomass installation plans, as their current attitude is to replace boilers when they break, not to plan ahead. For the sector to develop National and local Government is required to integrate the issues of climate change, into woodland management and biomass use, to re-frame the issue. Subsides are required to be in place for another 5-10 years for the sector’s steady growth; this needs to be linked to FC grants and integrated into all Government policies. The incentives put in place by National Government have stimulated the supply chain, and improved both supply and demand, this has led to an increase in UK timber prices and woodland management. This has led to a larger proportion of LAs woodlands being managed, as it has become more economical to do so. 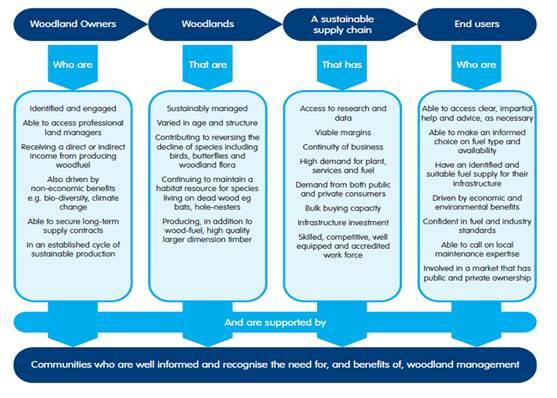 As woodland ownership in SY’s LAs is high it is important that all LAs have woodland managers, as this will continue the growth in the supply of timber to the market. The recession has affected the size of incentives and help Government has been able to provide for land owners to receive these, but the existence of a body such as SYF in the region has enabled the sector to grow previously, they have researched woodland owners and helped them with paper work for FC subsidies, this have helped to increase the region's woodland management coverage. The cuts of the funding to RDAs prevented more of this work being completed by the FC and SYF. The introduction of the RHI should make the use of bio-heat more affordable, this should encourage all LAs to look at the technology to reduce their dependence on fossil fuel use and costs. The high amount of biomass boilers across the region are likely to mean that the sector would be able to function if subsidies were removed, but this would slow down the growth of the sector. The high demand of woodchip within SY may help to stimulate increased bio-fuel-friendly woodland management, but market forces such as timber prices are still likely to dictate most woodland management. These market forces should not be allowed to fully dictate this sector, as short-term economics do not appear to be applicable to sustainable and prolonged woodland management. As mentioned in other sections the majority of interviewees believed that money was the main driver for land owners, but the increase in timber prices needs to continue for continued growth and management of woodland management. The firewood sector is a good example of this, as higher prices have enabled many smaller hardwood woodlands to become managed. Many woodland owners cannot be encouraged to manage their land for profit, as their priorities for the land do not involve profits. The small size of some woodland can make their management uneconomical; connecting together the management of a number of smaller woods in a heat doughnut could make this more feasible. The RHI could incentivise more land owners to manage their woods for their own fuel usage in the future; this incentive could persuade land managers to look at the technology as a viable option. 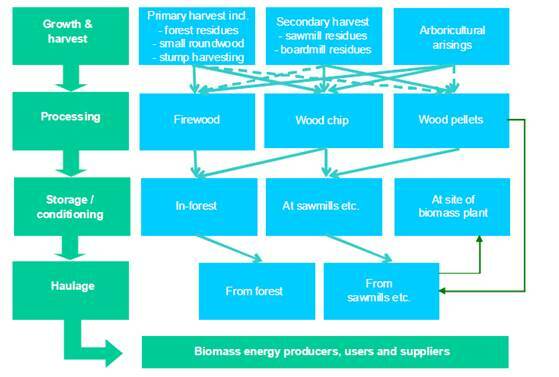 As the quality of timber from freshly managed woodlands is low this is likely to favour bio-fuel production; in the short-term this could bring higher levels of materials into the bio-fuels supply chain. As spoken about previously high fossil fuel prices are likely to be a key driver for influencing where customers source their energy from, and until they accept that these prices are no longer economical for them they are unlikely to change over to an alternative source. Table 23 : Which is more likely to cause change in energy use? 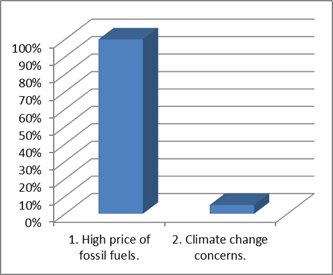 Table 23 demonstrates that approximately 95% of people believe that increased fossil fuel prices are more likely than climate change issues to change a change in energy source amongst user groups. The interview data agrees with this. Table 24 : Which of these key drivers will be most influential to sector's development? Table 24 shows that the respondents felt that government funding and fuel prices were the most important drivers for the continued development of the biomass sector. Interview data agreed with this. The incentives to increase timber production have come from the increases in timber prices, which have made woodland management more profitable. Grants and incentives from the Forestry Commission have made the process more affordable by subsidising the building of roads into these woods. Other incentives/policies such as the RHI have also had an impact on the sector, by making the installation of biomass boilers a more affordable process. The continued rise of timber prices could aid the continued growth of this sector, as higher prices will encourage more woodland management. The presence of SYF and the FC in the region could also aid with continued development of the sector, as they encourage more woodland management and development of the supply chain. In South Yorkshire it was viewed by many of the respondents that the region's woodland was lacking in coverage, quality and good access, these characteristics make the region less likely to be able to meet continued growth in the sector. The high levels of woodland ownership amongst local and national bodies does not help the sector's development, as these bodies lack liquidity and do not believe forestry to be a high priority issue. This issue is exaggerated by the lack of departmental policy integration, both locally and nationally, and the 2009's recession has also put further pressure onto the budgets of LAs. The short-term mindset of landowners and managers has meant that woodlands have been undermanaged for long periods of time, as woodland management requires a long-term view for high quality timber production this does not help the region's woods. The attitude of foresters to produce high levels of timber does not help the bio-fuels sector, as this can limit future amounts of bio-fuel production. The future of this sector relies heavily on continued subsidies from national Government and increased UK timber prices. It also requires bio-fuel production to become more mainstream, with forests managed for both timber and bio-fuels. A closer link between climate change issues and local authority woodland management budgets could aid with the region's future timber and bio-fuel production. The main driver for the growth in this sector is the continued rises in fossil fuel prices, as they continue to rise more people will seek out cheaper options. The management costs of woodlands, installation of a biomass boiler and burning of their own fuel could be subsidised by the RHI, the introduction of this incentive may persuade more people to consider this option. The presence of SYF and the FC in the region has enabled the growth of the sector in SY, and has encouraged the management of all types of woodlands. They have encouraged FC grants applications, and supplied land owners with relevant information on boiler installation and biomass producing, purchasing or selling. The region's bio-fuels provider (Silvapower Ltd) has also helped with this process, by providing chipping services to land owners. The introduction of the RHI and the high prices paid for firewood has also helped the sector to grow. The cuts of budgets of the FC and SYF, as well as the loss of the region's RDA, have prevented the continued pro-active approach, and the related increases in woodland management in the region. They helped with the grant application forms; as the complicated nature of these forms is seen as a big problem. Amongst the landowners, who do not manage their woodlands, it is perceived that they lack understanding of sustainable woodland management practices, and its link to woodfuel production. Many of these land owners perceive their woodlands as places of conservation or recreation; to change the mindset of these land owners could be very difficult. In the future the sector is likely to grow if fossil fuel prices continue to rise. The continued integration of climate change issues into woodland management and energy production could also help people to consider bio-fuel use. The continued presence of the RHI and acceptance of its relative longevity could persuade increased numbers of people to consider other feasible options. The previous help issued by the FC and SYF would have enabled higher levels of growth, but their continued existence with less resources is better than no advisory bodies. The influence of traditional forestry economics affects the likelihood of the sector's development, with higher management costs of poor access and lower quality timber affecting the likelihood of woodland management. The system for increasing the use of biomass in the UK relies on the increasing presence of climate change issues within politics, and its linkages to the Climate Change Act 2008, Renewable Energy Strategy 2009, Carbon Reduction Commitment, Renewable Heat Incentive etc. show that there appears to be the motivation within UK Government to decrease carbon dioxide levels. They plan to do this with the reduction of fossil fuel dependency through increased renewable energy use e.g. solar, wind and biomass. The UK Government has targeted that by 2020 they will produce up to 13TWh of its heat through biomass boilers (CEBR 2010), through utilising of waste wood from the timber production sector to heat small to medium sized boilers in community heating systems and municipal buildings and encouragement of localised heat production. In Lawrence and Dandy (2010) the authors found that biodiversity and conservation drove private woodland managers' decisions; this indicates that landowners do have pro-environmental ideas in-mind when choosing how to manage their woods. The harsh images of clear-felling in woodland management has left the majority of land owners to believe that all woodland management is bad, but when woodlands are managed sustainably it can raise, not lower, bio-diversity levels. The aim of the FC to change the behaviour of woodland owners, so they manage their woodlands for bio-fuels, as well as conservation and bio-diversity, this is possible but it would require the FC (or other bodies) to use the appropriate framework to present this (Collins et al. 2003). The previous existence of Yorkshire Forward in the region (in conjunction with the FC and SYF) enabled woodland owners to trust the persons advising them regarding woodland management (Collins et al. 2003), as they were not seen as being linked to Government. The social learning theory looks at how behaviour spreads through society (Collins et al. 2003), as a body like the SYF encouraged more woodland management and this became normalised amongst land owners, it is likely that social pressure, rather than economic pressure, could be the most considerable influence on woodland management practices. The social pressure could affect a land owners "needs and wants" (Kollmuss and Agyeman 2002, p.8), which could enable more bio-fuels production in the future. To stimulate increased woodland management the FC stated that funding needed to be injected into many areas, with all areas of the supply chain requiring help (Forestry Commission 2006). The plan envisaged the RDAs and regional FC offices working together to ensure the envisaged growth occurred (Appendix I), but as of 2010/11 a change in government led to Yorkshire Forward being disbanded, and the role which it played in regional economic issues coming to an end. The FC also suffered budget cuts which affected the FC's ability to implement the development of the biomass sector. the decreased role of the FC and SYF in the region is likely to have a detrimental effect on the region's ability to continue to increase its woodland management and boiler uptake; without continued funding to bodies such as these the sector's future is unlikely to flourish like it might have done, prior to the budget cuts. In conclusion this research found that the region's woodlands have the possibility of supplying the region's biomass boilers with sufficient fuel in the future, but this is only likely to happen if funding is increased to relevant actors in the region; without the sufficient amount of funding in place it is unlikely that the sector will grow at previous levels. In conclusion this research looked into the woody bio-energy market in South Yorkshire, to understand what had influenced the sector's development so far, what the barriers were to its continued growth and if these could be overcome. This literature review introduced the topics of climate change and the policies introduced by the UK Government that have led to the development of biomass sector within the South Yorkshire region. This section demonstrated why the UK Government had chosen to back the growth of the woodchip market, what would affect the sector's continued growth in the region and nationally and what the projected growth of the sector is. This research analysed relevant documentary data acquired as well as using a mixed methodology approach to understand the opinions of key stakeholders in the region through interviews and questionnaires. The secondary research discovered that the region is unlikely to be able to meet future demands of woodchip in the future, due to low levels of woodland cover and low levels coniferous woodland. The traditional woodchip sector relies on softwood material to supply the sector's demands, utilising waste wood as part of timber production, but these low levels of softwood material make the projected growth of the sector in the region less likely. The method used to gather this evidence involved relying on the goodwill of others to pass on relevant unpublished data, this data is not complete or detailed enough to draw accurate conclusions solely from the results, but the findings have helped to illustrate the research findings. The primary research discovered that the region's woodland have poor access, poor quality timber and has large amounts owned by local authorities. Issues affecting the success of this sector, such as funding and attitudes towards woodland management, were discovered through the primary and secondary research. The number of interviewees and validity of the questionnaires were limited by time and cost, without these constraints the findings may have altered. The research discovered that the introduction of the CRC and RHI, as well as the increases in fossil fuel and timber prices have helped to encourage the growth of the sector, through increases in supply and demand of woody bio-energy. The immaturity of the sector's supply chain in the region prevents the sector from competing unsubsidised; without continued funding to all areas the sector is unlikely to continue its previous growth. A potential future area of growth is the continued development of woodland management by small woodland owners; the utilisation of this material by owners would decrease fossil fuel use and increase woodland management levels in the region. The high levels of low quality woodlands in the region make it unsuitable for timber procurement, which could lead to high proportions of this managed material going into the bio-energy market. 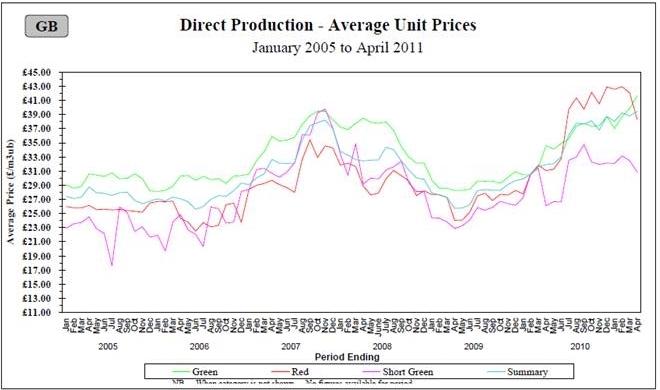 High fossil fuel prices and the RHI incentivise the growth in this part of the market. A barrier to the growth of this area is the private woodland owners and their attitudes to woodland management, if it is possible to encourage this group to radically change their priorities and educate them in woodland management, then it is possible that the region's woodlands could supply renewable heat for the region in the future. Without the funding in place to help this process occur then the region's low woodland coverage and poor quality timber is likely to affect its continued growth in the future. If this research was completed again it would be unlikely to gain access to sufficient data on woodland ownership in South Yorkshire, as this would require high levels of time and money, as well as access to all Forestry Commission data. AEA (2010). 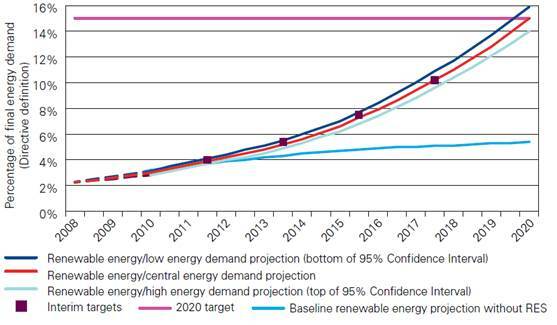 Analysis of Renewables Growth to 2020. London, DECC. AFO (2010(b)). UK Regional Description of Private Forestry Owners. Current Supply, Future Potential and Local Barriers to Harvesting Woodfuel. York, AFO. AFO (2011). UK regional report on current roundwood markets and the role, new possibilities and co-operation between PFOs and traditional forest industry in the woodfuel supply chain. York, Forestry Commission. AFO (2010). 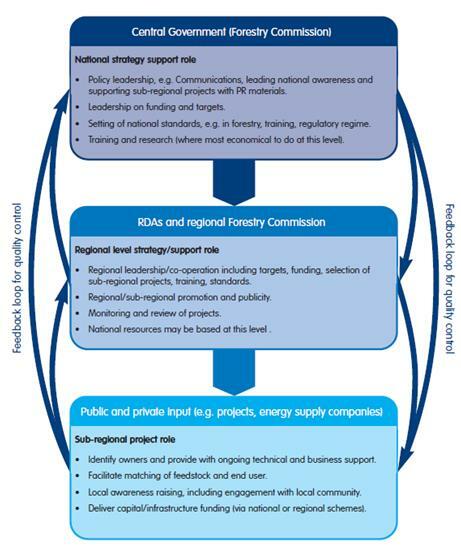 UK Regional reports on the identification of PFOs to sell and/or produce woodfuel. York, Forestry Commission. BLAXTER, L, HUGHES, C and TIGHT, M (2010). How to Research. 4th ed., Maidenhead, Open University Press. BRINGEZU, S, et al. (2007). Towards a sustainable biomass strategy. Wuppertal, Wuppertal Institute. BRYMAN, A (2008). Social Research Methods. 3rd ed., Oxford, Oxford University Press. CEBR (2010). The economic value of the woodfuel industry to the UK economy by 2020. London, CEBR. COLLINS, J, et al. (2003). Carrots, sticks and sermons: influencing public behaviour for environmental goals. London, Demos/Green Alliance. DECC (2011). Renewable Heat Incentive. London, UK Government. DECC (2011(b)). Renewable Heat Incentive. London, DECC. DECC (2009). The UK Renewable Energy Strategy. London, HM Government. DEFRA (2007). UK Biomass Strategy. Defra. DEFRA/DTI (2003). Changing Patterns: UK Government Framework for Sustainable Consumption and Production. London, Defra. DENSCOMBE, M (2010). The Good Research Guide: for small-scale social research projects. Maidenhead, Open University Press. ENVIRONMENT, AEA Energy and (2007). Yorkshire and Humber Vision for Biomass. Didcot, Yorkshire and Humber Assembly. FORESTRY COMMISSION (2006). A Woodfuel Strategy for England. Forestry Commission. FORS, Per-Martin (2009). The German, Swedish and UK wood based bio energy markets from an investment perspective. Uppsala, Swedish University of Agricultural Sciences: Faculty of Forest Sciences. GIELEN, D J, et al. (2001). Biomass for energy or materials? A Western European systems engineering perspective. Energy Policy, 29, 291-302. GILLHAM, B (2000). Case Study Research methods. London, Continuum. GILLHAM, B (2005). Research interviewing : the range of techniques. Maidenhead, Open University Press. GRINDSTEDT, A (2005). Interactive resources used in semi-structured research interviewing. Journal of Pragmatics, 37, 1015-1035. HALL, P.J. (2002). Sustainable production of forest biomass for energy. The Forestry Chronicle, 79 (3), 391-396. HM GOVERNMENT (2008). Are Biofuels Sustainable? London, HM GOVERNMENT. JABLONSKI, Sophie, et al. (2010). The role of bioenergy in the UK’s energy future formulation and modelling of long-term UK bioenergy scenarios. Energy Policy, 38 (10), 5799-5816. KOLLMUSS, A and AGYEMAN, J (2002). Mind the Gap: why do people act environmentally and what are the barriers to pro-environmental behavior? Environmental Education Research, 8 (3), 239-260. LAWRENCE, A and DANDY, N (2010). Landowners’ attitudes to woodland creation and management in the UK: a review of current evidence. Forestry Commission. NNFCC (2005). Woodfuel heating iin the North of England: A Practical Guide. York, NNFCC. RACKHAM, O (1980). Ancient woodland : its history, vegetation and uses in England. London, Edward Arnold. RACKHAM, O (2006). Woodlands. London, Harper Collins. ROTHERHAM, I. D and JONES, M (2000). The impacts of Economic, Social and Political Factors on the Ecology of Small English Woodlands: a Case Study of the Woods in South Yorkshire, England. Forest History: International Studies on Socio-economic and Forest Ecosystem Change, 397-410. SDC (2005). Wood fuel for warmth. Scotland, SDC. SHU (2003). Carbon and energy balances for a range of biofuels options. Sheffield, SHU. STERN, P.S., Dietz, T., Karlof, L. (1993). Values orientation, gender, and environmental. Environment and Behavior, 25 (3), 322-348. STRACHAN, N, PYE, S and KANNAN, R (2009). The iterativecontributionandrelevanceofmodellingtoUKenergypolicy. Energy Policy, 37, 850-860. TSO (2009). Combating Climate Change: A role for UK's forests. Norwich, TSO. UK TREASURY (2006). Stern Review on the Economics of Climate Change. LONDON, HM GOVERNMENT. VERDONK, M, DIERPERINK, C and FAAIJ, A P (2007). Governance of the emerging bio-energy markets. Energy Policy, 35, 3909-3924. YORKSHIRE AND HUMBER ASSEMBLY (2004). A regional strategy for trees, woodlands and forestry in Yorkshire and Humber. York, Forestry Commission. Setting ambitious, legally binding targets. Taking powers to help meet those targets. Establishing clear and regular accountability to the UK Parliament and to the devolved legislatures. (Department for Climate Change 2012).